I have the honor of hosting this week's sugar bolus! What have I cooked up for you this week??? Something pretty wonderful that we LOVE! This week I am giving away a $30 gift certificate to Petite Baubles! 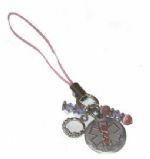 We offer High quality Boutique style beaded baby, children and adult bracelets and jewelry at a reasonable cost. We use only the finest quality materials to ensure that your piece of jewelry will last. As a mom with a child with special needs I know how scary it can be to take them out into the world. Even more so to let them go on their own. A medical ID tag is my first line of defense. I know that if my child gets into trouble they will get immediate attention, AND that the rescuer will be able to contact me, or other important people. The biggest dilemma...how to get them to wear the tags! That's how Petite Baubles Boutique was born! 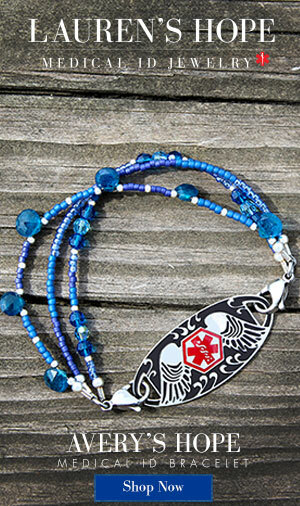 Fun, stylish and affordable jewelry to compliment your medical ID tags. Now the questions is will you wear your tag today but WHICH bracelet will you choose to wear today! No matter whether it be a penny, a dime or even dollar amounts.. those few pennies, dimes and dollars are helping in finding cures..
Sound like a great place??? It is! And I can fully attest to that! See the cute little crown bracelet? That's Sweetpea's Medical Alert bracelet! When Sweetpea was first diagnosed, we got brochures in the hospital for medic alert bracelets. I looked through them in the hospital... but they were all so expensive. And Sweetpea had JUST turned 3. She had NEVER worn a bracelet. REFUSED. I didn't want to spend a lot of money for something she might not wear. BUT... I wanted something cute! When we got home, Sweetpea and I searched the Internet together looking for a cute bracelet... and we found Petite Baubles. It something fun and light hearted for us to do. And that was a time when we desperately needed something fun. Picking out and getting her cute little bracelets in the mail was a ray of sunshine during a rather dark time. You see.... it's MORE than a bracelet to keep her safe. We both fell in love with the super cute bracelets that they offered! Honestly, I was a little skeptical if they would last - if they could handle the daily wear and tear of a toddler. Sweetpea LOVES these bracelets. From the moment they arrived, she was smitten. This child, who had never worn a bracelet before, put it on and never took it off. Truly! She often wears them to bed! We started with the Miss Kitty bracelet and then got the Princess Crown bracelet for a back up! We quickly realized that having an extra is a necessity! One of the other things that I loved about Petite Baubles is that they offered very small sizes! Not every place out there offers bracelets for a very small wrist... but they do! They don't JUST do bracelets, though..... Look at this list of things you can choose from... for children OR adults... Whether you're a PWD, CWD, or not! I KNOW you want this! Here's what you have to do be the winner! ● Leave me a comment before midnight on Thursday, September 30, 2010. Please include your first name. Comments left without a name will be eliminated. containing a link to your tweet. ● No duplicate comments are allowed. Duplicate comments will be eliminated. ● The winner will be selected via random draw at www.random.org. 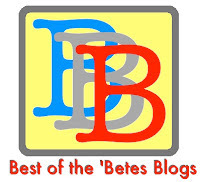 ● The winner's name will be posted here on this blog on Friday, October 1, 2010. 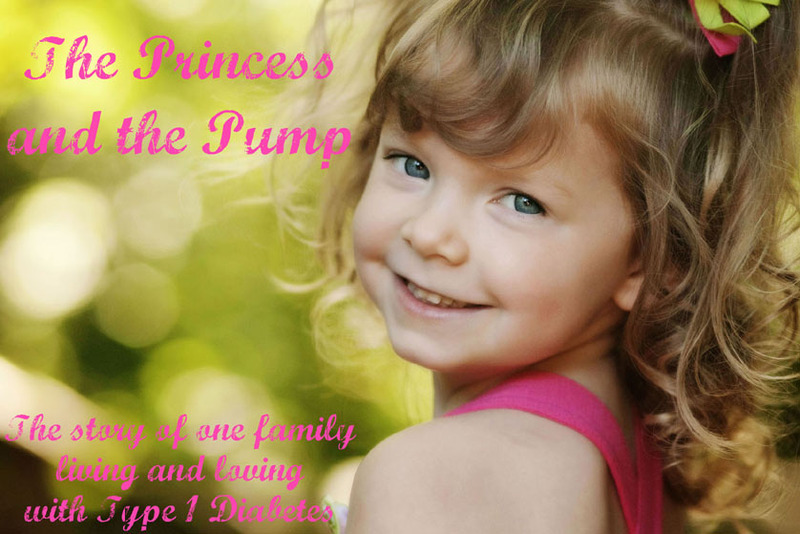 ● After the winner's name is posted, he/she will have 48 hours to send a message to me at theprincessandthepump@gmail.com. If I do not hear from the winner within 48 hours, I will select a new winner. Remember, to enter you must leave me a comment with your first name before midnight on Thursday, September 30th. Count me in! Those are adorable! We have an ID bracelet from Petite Baubles also and really like it. We'd love another one! I am a bad Mom... Elise STILL doesn't have an ID bracelet, two years later. I'd LOVE to win this one! Count me in!! I'm intrigued by the zipper pulls! Just looked at their stuff...so cute...we would love to get one! Please count us in. My Ellie has one of these too! We LOVE them! Would love another! Justice loves D accessories! Count us in! 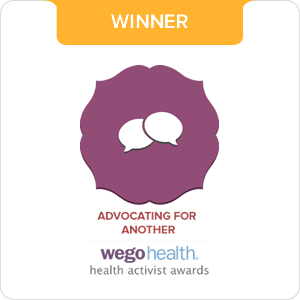 Lisa P. -This would be perfect for Larkin and all her food allergies! Lisa P - Posted on Facebook too! Hi! Count us in too! Count Brianna in. I am always looking for a good bracelet. Awesome givaway! 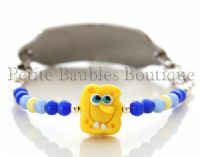 I might have to order that cute Spongebob bracelet for Adam - maybe THAT will get him to wear a bracelet! We would love to win the Hello kitty bracelet-she already has ID tags that would transfer right onto that band. Posted on FB. Thank you for the opportunity! I would love this. I purchased my daughter's bracelet 1 1/2 years ago and it is still in great shape. The best and cutest around!! Posted on Facebook too!! Count me in! Those bracelets are adorable!! Thanks for the giveaway, my Kortnie (my name is Amanda) would love to win, we have shopped at petite baubles before, like you right after her diagnosis. Would love to be able to get something new, I'm thinking Christmas stocking stuffer! Super cute! My 5 yr old T1 would love a girly one! one more thing... if I'm so lucky as to be picked, you might need to give me more than 48 hours to respond. I'm off-line from Fri-Mon. Thanks! 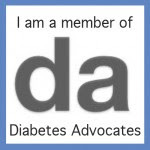 Always looking for something to make having to live with type 1 a little cuter!